Same logo as before, but with an updated wordmark, a slightly tweaked version of the one above. I also changed the yellow to Process Yellow to make it less "volty", but still brighter than traditional athletic gold. The blue is the same blue the Chargers currently wear. The dark charcoal gray provides some contrast to the bright primary colors. 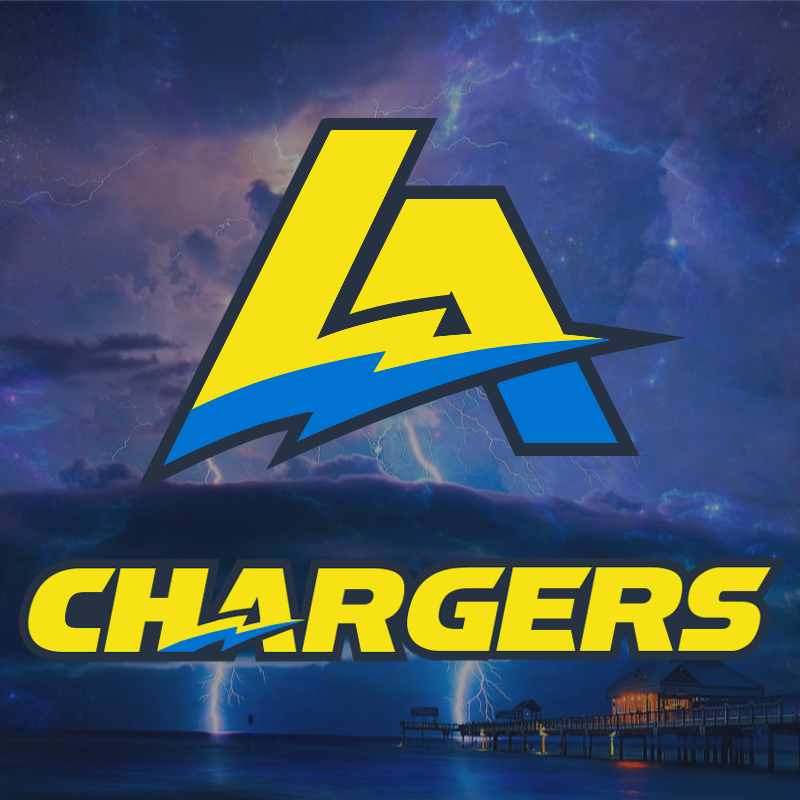 The idea was to maintain the Chargers overall identity but to refresh the brand with new logos and colors to bring some excitement to the team in its new location and give the LA Chargers a distinct look from the San Diego Chargers. The Chargers had some of their best years wearing blue helmet, but they have never worn Powder Blue helmets,and the NFL has a surplus of boring white helmets. As you can see, I designed a new helmet bolt, matching the style of the new primary logo. The jersey bolts, traditionally placed on the shoulders are now on the sleeves, reaching across the chest of the jersey. The blue home jersey would be worn, primarily with white pants and the the white jersey would be worn primarily with blue pants and graphite socks. I'm not sure how visible the yellow numbers would be on the white jersey in practice, but blue numbers, with either a yellow or gray outline just didn't feel right. The alternate jersey is graphite gray, paired with matching pants and blue socks. It could also be worn with white or blue pants, but I just hadn't shown the gray pants yet and I don''t hate the mono-gray combo either. The color Rush uniform is just the standard blue jersey and pants, paired with solid blue socks. I toyed with the idea of a yellow color Rush uniform but it was way too bright. maybe a white uniform is worth looking at for Color Rush? I'm definitely open to any and all feed back on the Chargers so fire away. Thanks for having a look. 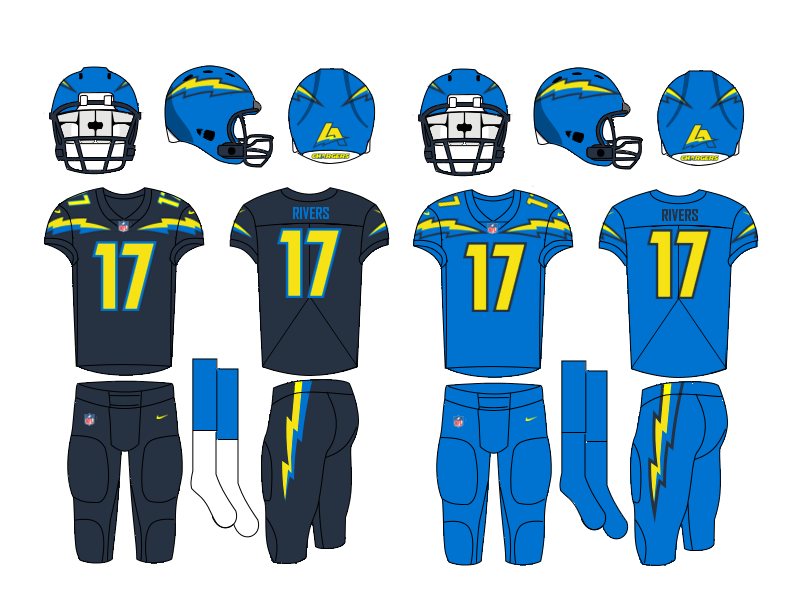 I'm strongly against the Chargers being in LA, but I love this branding and uniforms. I would agree with you there. I just figured that since it's been such a poorly received and messy breakup, a new look that isn't associated with San Diego would be a good way to go. 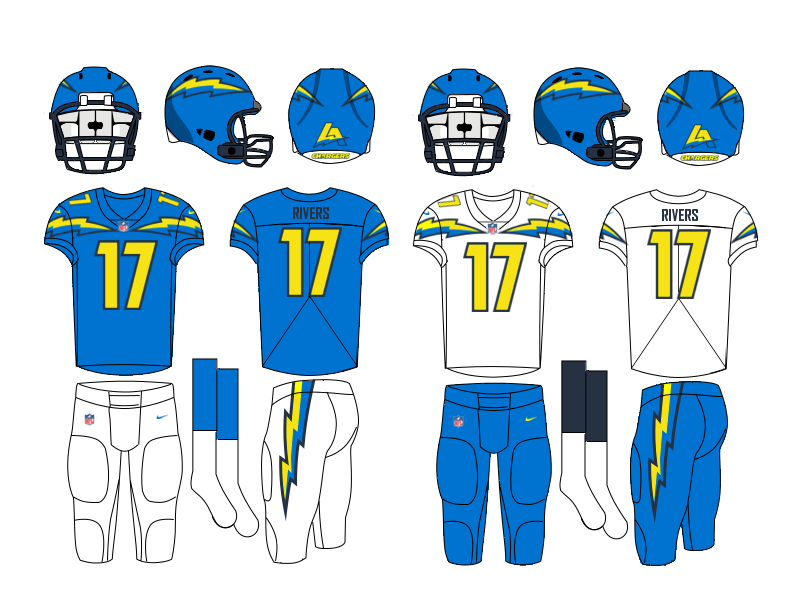 Any look that still includes the lightning bolts and the Chargers name will still be associated with San Diego. As I said when they moved, they needed to rebrand and leave the Chargers name behind for a future San Diego team to use. I disagree with that man. The name is a much bigger part of the brand than the city. Lots of NFL teams don't even have the city in their wordmark or it's very small, at least. I don't care if the Jazz are in Utah because they were an established NBA brand. The Hornets should be in New Orleans, where they had moved as a strong brand and added yellow to give the identity some New Orleans flair, but they were still recognizable as the hornets. Now we have the Bobcats playing Hornets dress up in Charlotte. Hell, I wouldn't even think the Baltimore Browns would be out of place. The Ravens are the original Browns, after all. Now don't get me wrong, there are times when a total rebranding coinciding with a move just makes sense, but most of the time I think it's better to keep the basis of an team's identity intact. Change up the colors, redo the logos, but generally the name should stay because it's important and valuable. It's not like the team ceased to exist, they just moved. 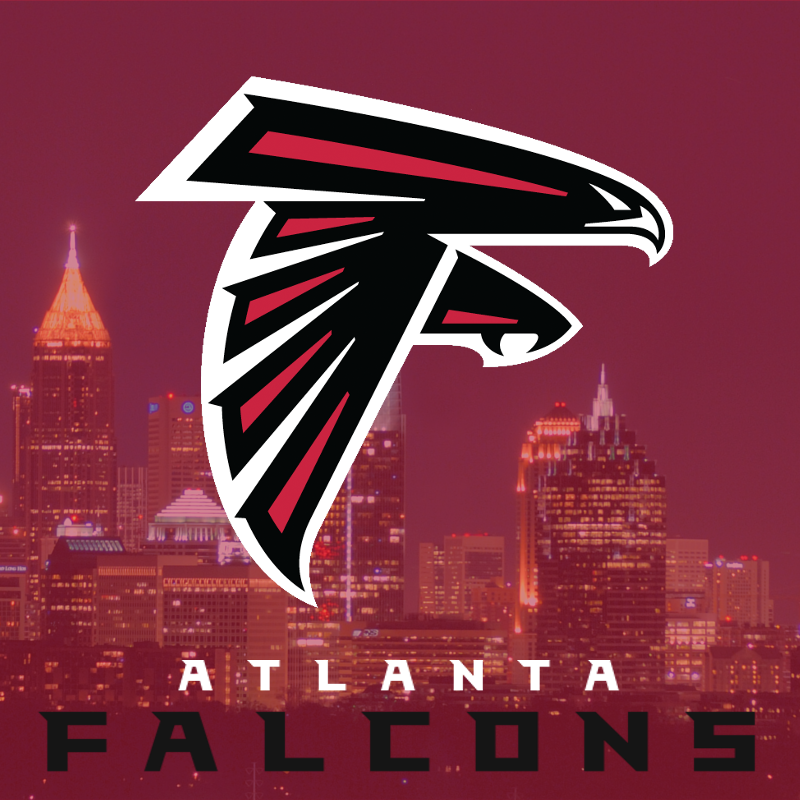 Now, I don't think the Falcons need a total overhaul and their current logo is worlds better than the old one, minus the silver outline. 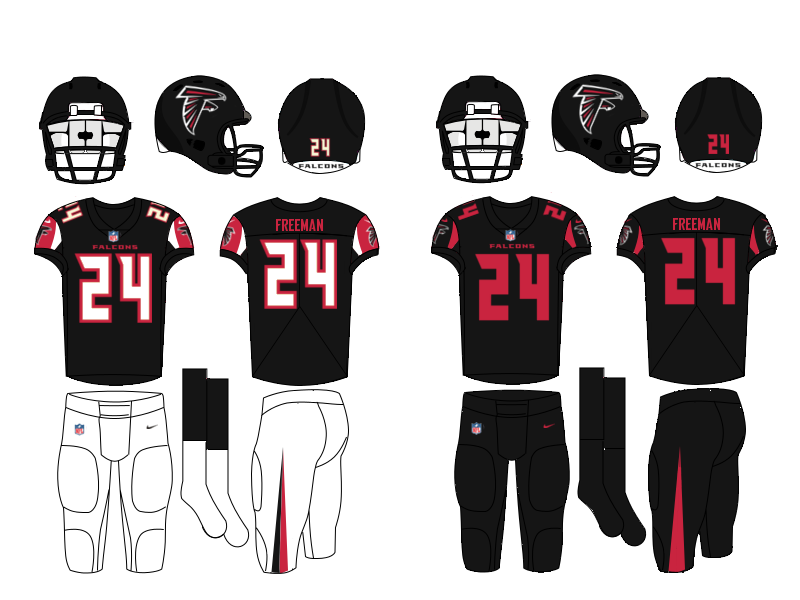 I actually like the Falcons uniforms and I loved the change from black to red primary jerseys. What I don't like, though, is the piping on the sleeves, collars and down the sides of the jerseys and pants. It really dates the uniforms in my opinion. 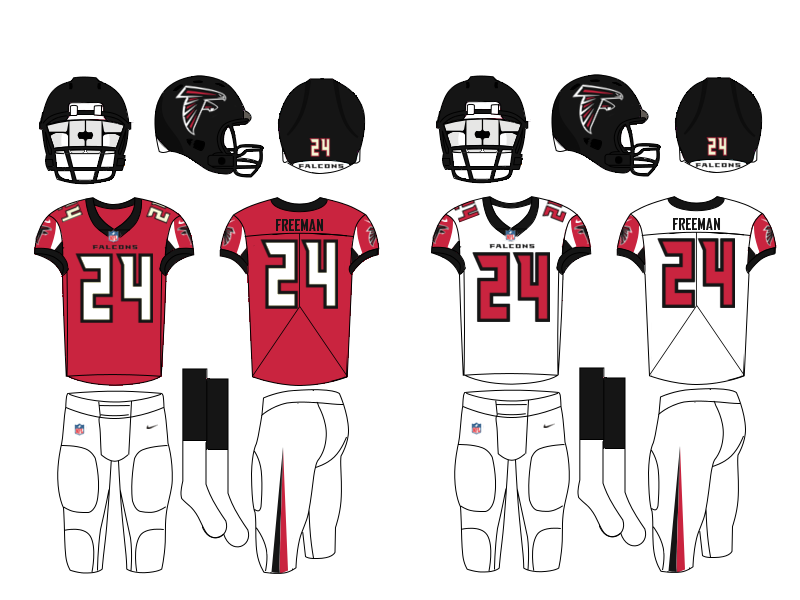 So basically my Falcons concept is more like a tweak than a redesign. I got rid of the piping and the underarm panels, keeping the sleeve design. I also changed the number font to something more similar to the wordmark. I tweaked the pants stripe to tapered two-color design as well. I brought back the black alternate jersey and a black and red Color Rush uniform. So so as always let me know what you think. There aren't any big changes but I think the changes are improvements over the current set. Thanks for having a look. 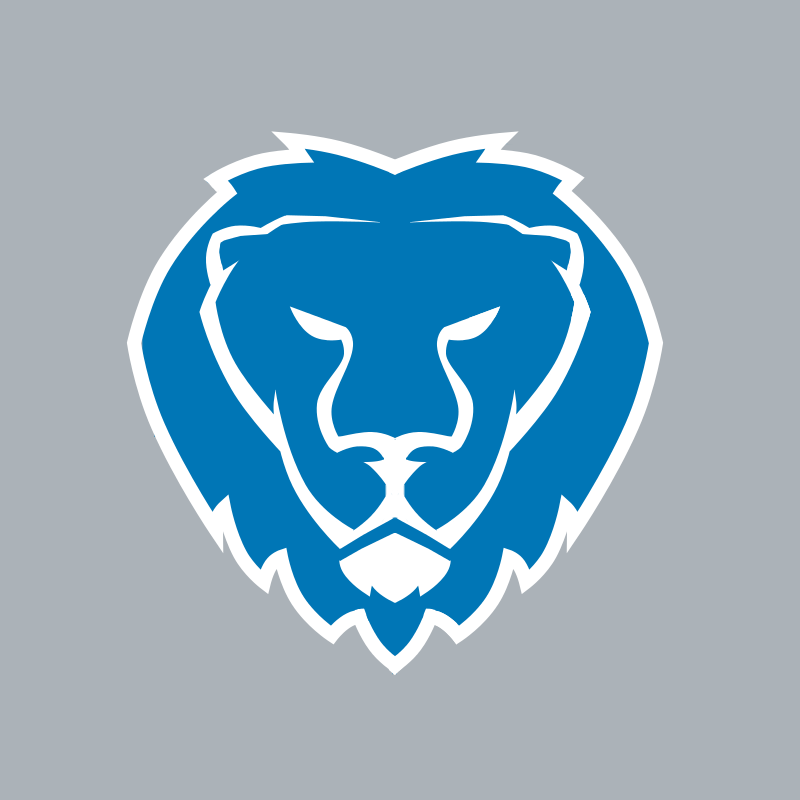 No new uniforms yet today, but I do have a new secondary logo for the Detroit Lions to be used on the helmet nose bumper and/or apparel. The idea was inspired by automotive badges like the Dodge Ram logo. I'm pretty happy with it but I know it's not quite a finished product so any C&C is definitely appreciated. Thanks for taking the time to have a look and please let me know what you think. Got another new one today, starting with a new logo. 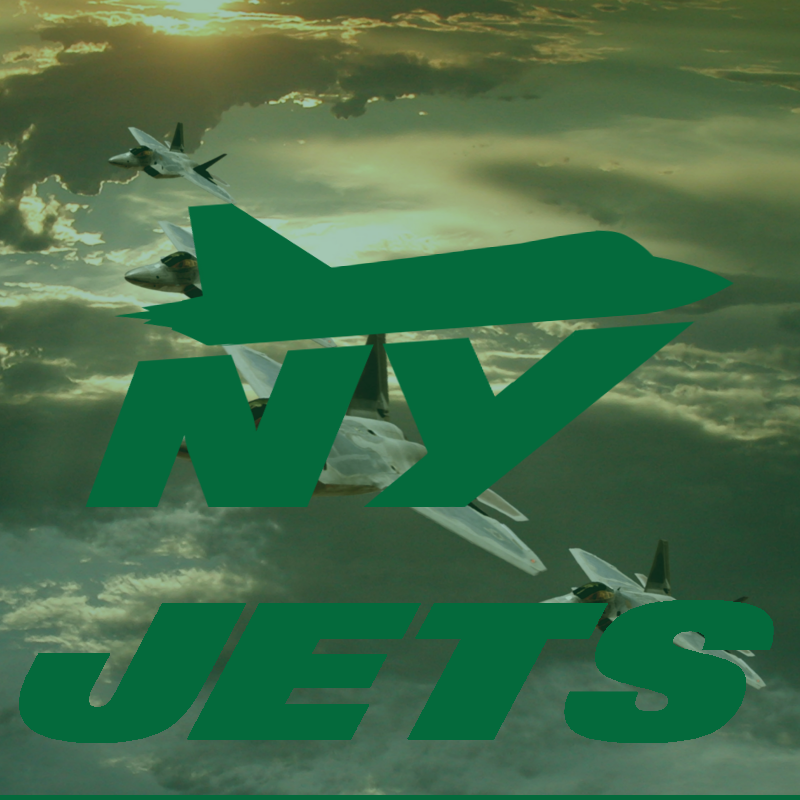 My new jets logo is sort of inspired by the 80's logo with the jet flying above a Jets script. Kelly green is just creaming to be scooped up again by an NFL team. I know lots of people would love to see the Eagles make the return to kelly, but I think, at this point, the Jets are a better candidate to return to the color. The new jet is larger, and the silhouette is heavily based on the U.S. military's F-35 fighter jet. Underneath the jet is an italic stylized NY monogram. It is a pretty simple logo, but is dynamic and modern, but doesn't feel trendy. 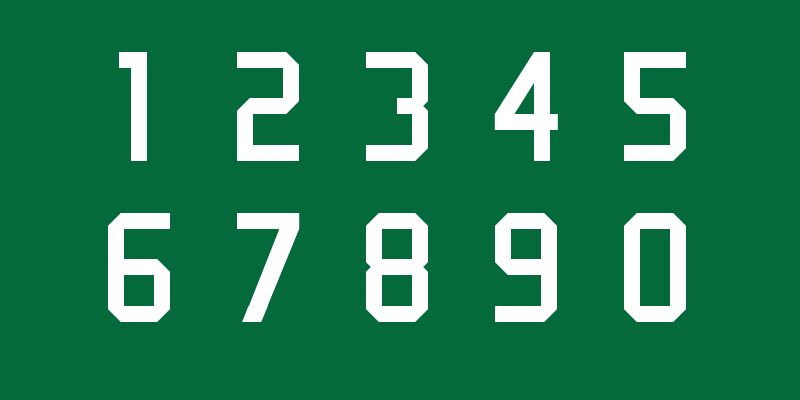 I also designed a custom number font based on the ID numbers on the tail stabilizers of military jets. it is a modified block font that is unique to the NFL, but doesn't sacrifice function for the sake of being different. 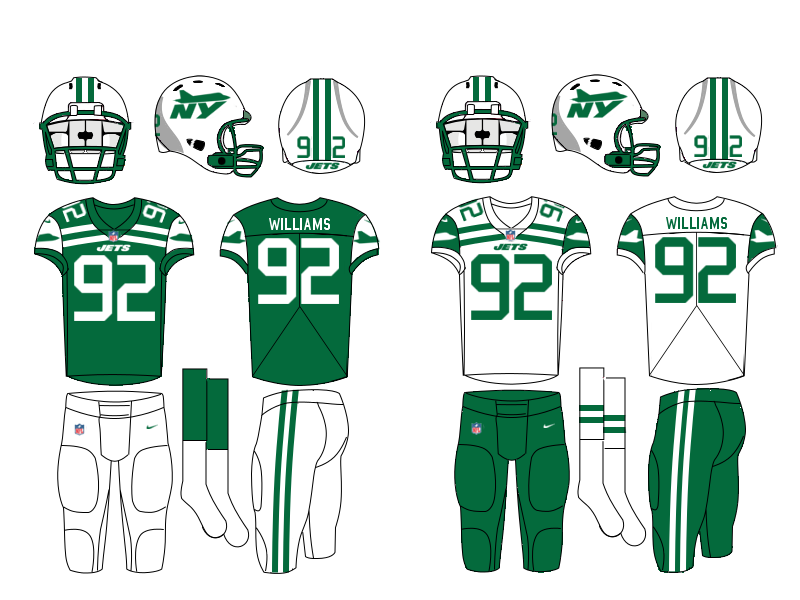 I think the one defining feature of the Jets uniforms throughout the team's history has been the double stripe, which has been present on the uniform in some form or another for years. I wanted the uniforms to feel like an evolution of the classic Namath era uniforms and the current fauxback uniforms. Contrasting sleeves remain and the stripes move to the chest as real estate for proper stripes on the shoulders and sleeves of football uniforms shrink. 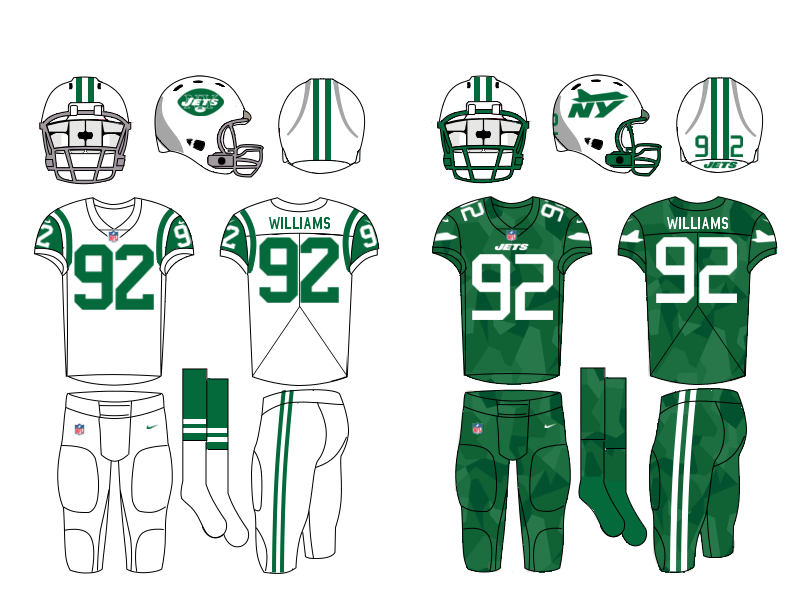 The alternate uniform is a throwback to the Super Bowl III winning uniforms where Broadway Joe Namath guaranteed a win and the Jets shocked the Baltimore Colts. The Color Rush uniform is a uniform I try to have some fun with so I decided to go with a sublimated geometric camo pattern that is used on some fighter jets. As always, let me know what you think about the Jets and the Lions logo and thanks for taking the time to have a look. I like this (as long as it is just going to be a secondary)! I can feel the auto badge vibe. The only changes I might suggest would be to make the ears a bit bigger, make the bottom mane point a little shorter (to align with the implied line of the rest of the mane), and add a forehead scowl wrinkle (although I know you don't want to go overboard and make it too detailed). Nice work, I'm excited for uniforms! I'm just curious, did you try putting just the jet on the helmet? The simplicity of it could be really cool! On the lion, something about the forehead looks large. Maybe finishing the forehead line and having it come down to a point could look cool? Either way, I love these designs! They're very clean and unique. Can't wait to see the rest! I did try using just the Jet and I thought it made the helmet feel a little empty. Maybe I'll enlarge it so it wraps around the back line of like the Seahawks? I think that could look cool. I also think you're right about the Lions forehead. The way the lines terminate make his forehead look huge, a little more definition would help. 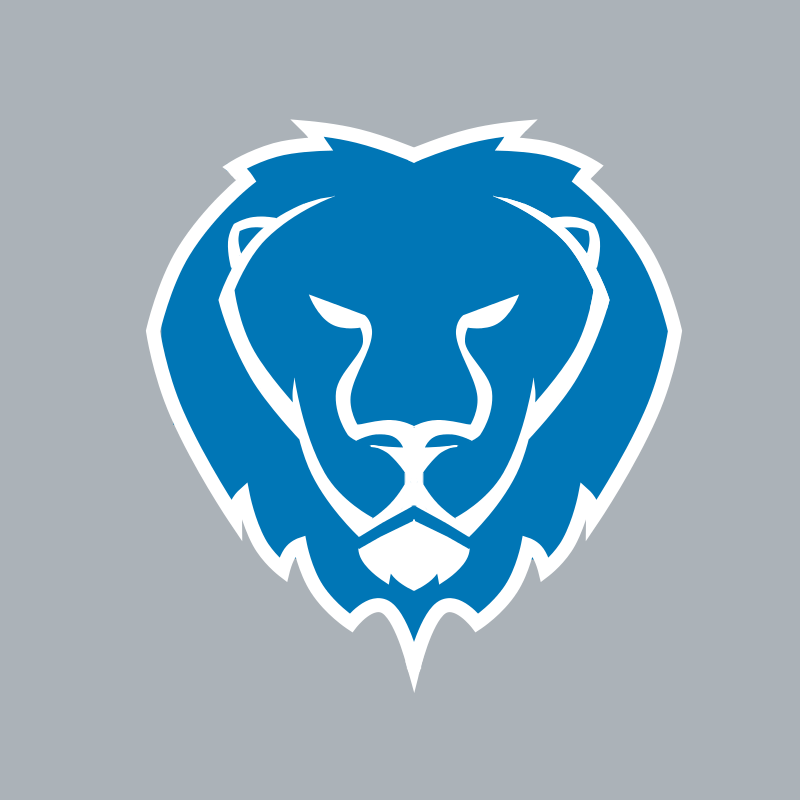 Here's an update to the Lions secondary logo, per some suggestions by @JViking5 and @LogoMark. I made the ears a little bigger and defined the forehead a little more. I also fixed the bottom point of the mane and I think it's a big improvement after seeing the change. I also tweaked the nose just a little bit because the more I looked at it, the less I liked it. 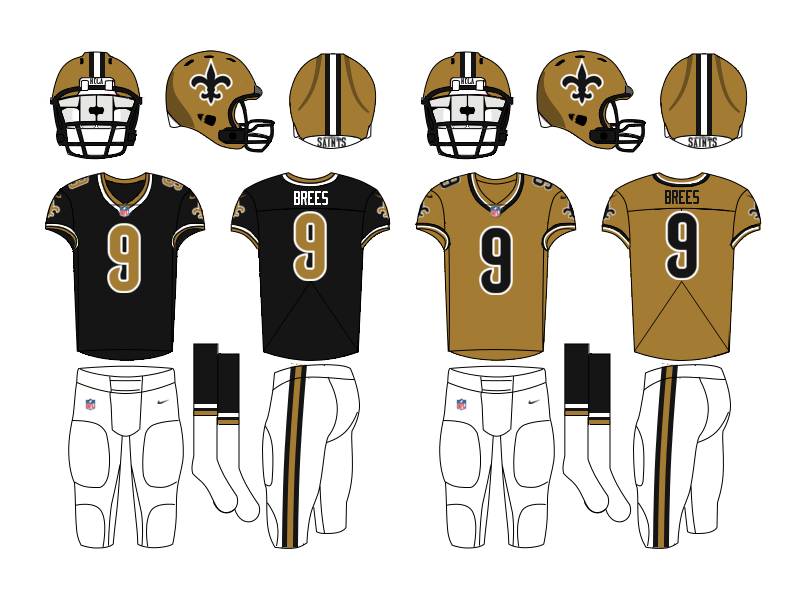 I've also got some new logos and uniforms for the New Orleans Saints. My two biggest gripes with the Saints are the dull khaki gold they use and the logo with a dozen outlines, so I fixed those problems. 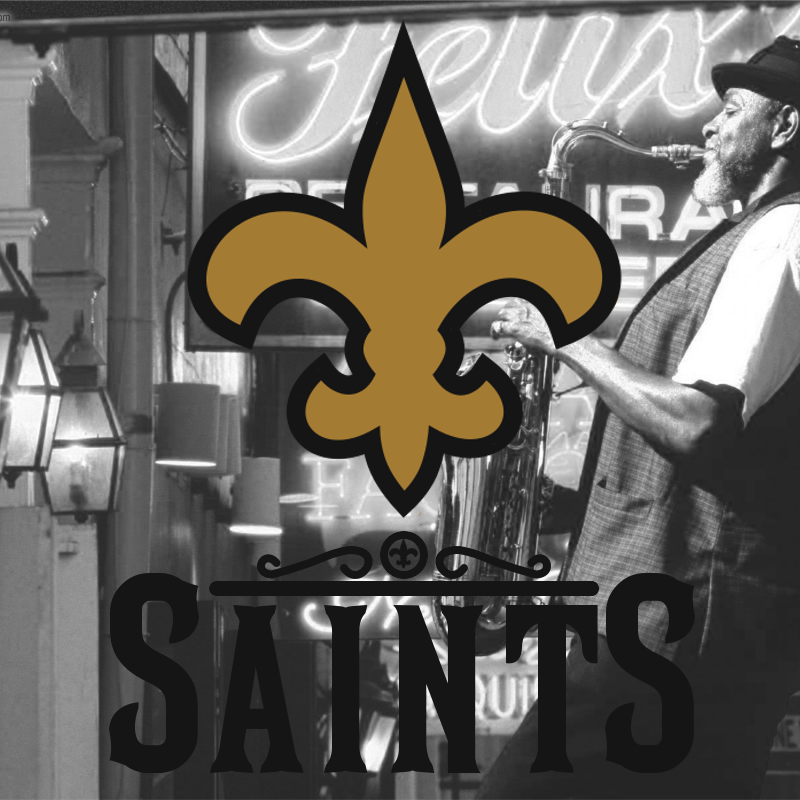 I simplified the outlining on the logo to one bold outline and changed the gold back to the original, rich old-gold the Saints used to sport. I also designed a new wordmark with some wrought iron inspired detailing. As for the uniforms themselves, the current jerseys are good enough, but kind of boring, and the black pants are dumb, especially with no stripes, and there's no reason for the striping on the gold pants not to match the striping on the gold helmet. My goal was to give the uniforms a little more life and use a more consistent striping system. The most iconic piece of the Saints' uniforms has to be the gold helmet with the fleur-de-lis and traditional stripe. I based by whole uniform design on that idea. The helmet logo is a little bigger and I decided to keep the logo on the sleeves because I think it looks good there. The collar an cuffs have a new three stripe pattern that I think compliments the helmet and pants well and gives the jersey a little more flair. I have always loved the gold numbers on the Saints vintage uniforms and the Color Rush jersey, so I used gold numbers in my design. I decided to stay away from black pants an go with a pair of white alternate pants instead, which could be a nice change of pace and could be worn with any of the three jerseys every once in a while. 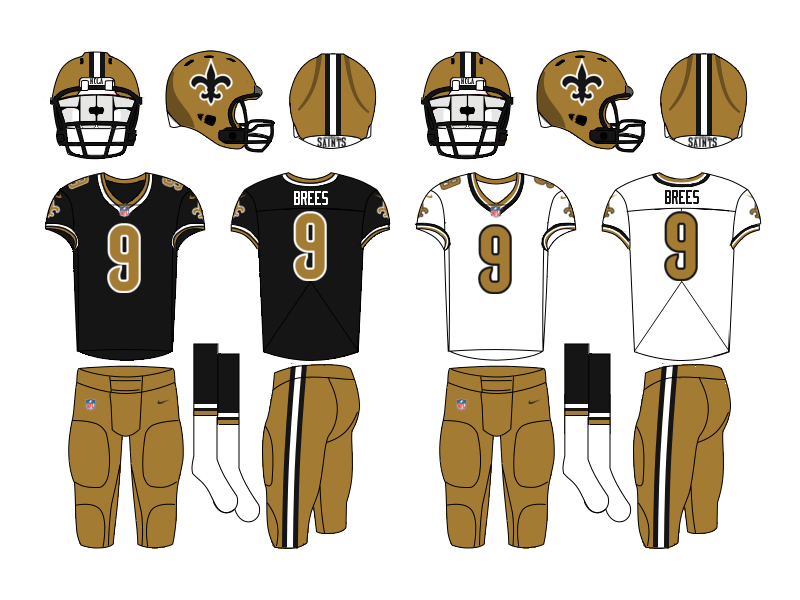 So, since the news broke that Color Rush may not necessarily mean head-to-toe monochrome, I decided to pair the alternate/Color Rush gold jersey with some white pants, which is a look that is more befitting of an NFL franchise, and the Saints would still have a mono-gold uniform is they really 'needed' to wear it. Well that's it for today. Thanks for taking a look and feel free to let me know what you think. Great revision on the Lions logo! Here's a new one for the day, DA BEARS!!!!!! I mad a tweak to the outline of the classic Wishbone C. Now it always has only one outline, contrasting the background color. I also updated the wordmark, keeping the same feel but using a more contemporary font. 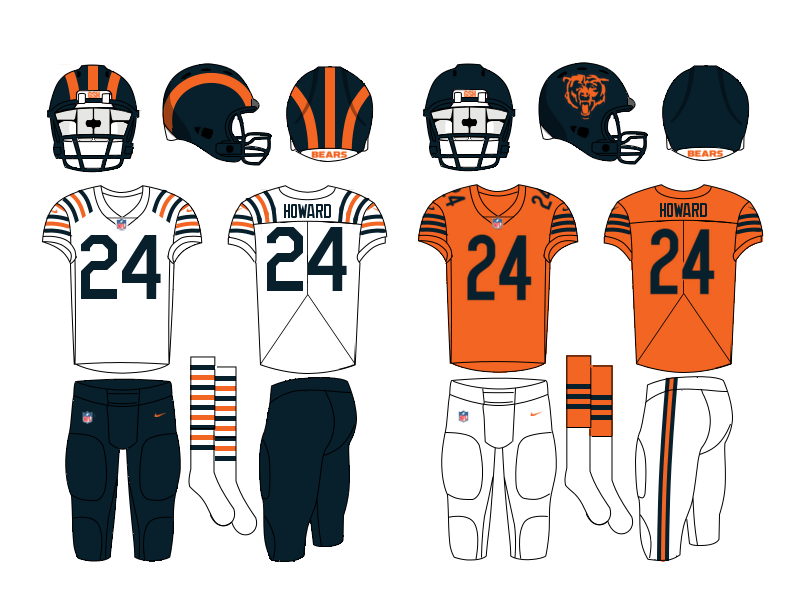 Now, the Bears don't have bad uniforms by any means, but I think they could use some updating. Originally, I was thinking of something a little more out there, similar to @Brave-Bird 08's Bears concept, but ultimately I decided to go more conservative. The most significant change is a change to the striping, now the striping on the blue jersey is the inverse of the white jersey striping. I also flipped the striping on the blue pants to "match" the striping on the white jersey, the same way the white pants "match the blue jersey. The GSH memorial is now on the front helmet bumper, instead of taking up real estate on the sleeve. These combos would be the primary uni combinations, but the white pants could be worn occasionally with the white jerseys. The alternate uniform is a throwback to the Bronko Nagurski era uniforms. I thought the helmet design and wild stripes would be a fun way to change it up once or twice a year. Since the NFL relaxed the Color Rush program the orange Color Rush jersey is paired with white pants. 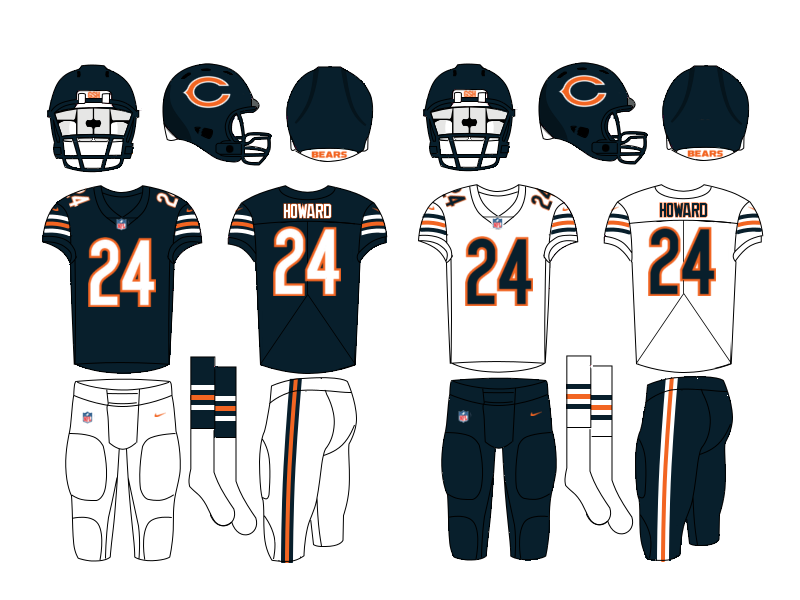 The jersey is a fauxback based on the orange jerseys the Bears have worn historically. 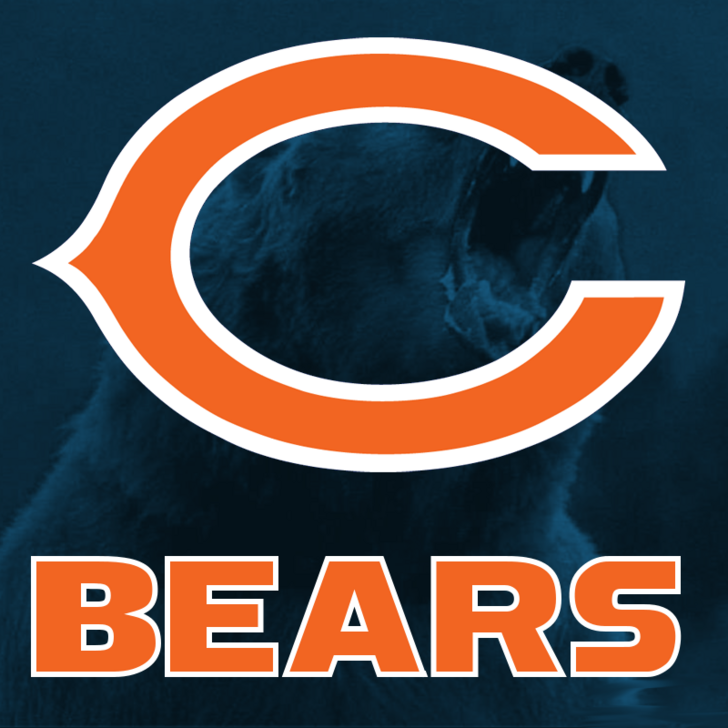 I love the Bear logo, but I couldn't find a good place for it on the primary uniforms, so I am using it as a helmet logo on the Color Rush fauxback. Well, that's it for the Bears. Thanks for taking a look and please feel free to offer any C&C. I'm looking forward to what everyone thinks. Not sure what you mean by C stripe? Could of sworn I just answered this question. You did. Accidental double post on my end. I see what you're saying about the stripes now. I hadn't thought of that, I was just using an old helmet design that I thought was cool.